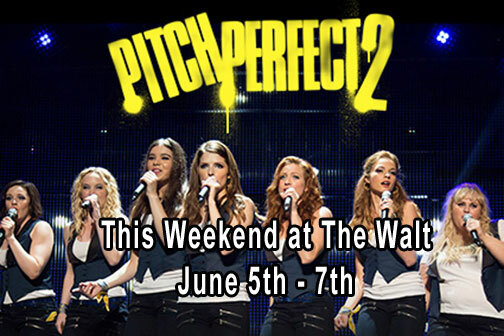 There will be three showings of Pitch Perfect 2: Friday 7:30, Saturday 7:30, and Sunday at 2 p.m.
Friday June 5th and Saturday June 6th - Doors open at 7 p.m. with showtime at 7:30 p.m.
Sunday June 7th will feature ONE showings at 2 p.m. Doors will open 30 minutes before showtime. Next weekend at The Walt Theater, June 12, Tomorrowland.